Happy Monday, I hope you had a wonderful weekend! What's cookin' in the Kitchen today? I didn't share any Pig images last week using the new KSS July Release Ducks & Pigs, I was trying to tweak the colors of the Pig before I posted any cards. I think I've got it now, of course I may change my colors as time goes on. I even went as far as to Google for pig images just to check out the coloring....Do you know how many different colors of pigs there are! I used MJ's TSSC78 for the inspiration for my card. To create the pigs I stamped the following images on White card stock in this order: #2 Pretty in Pink, #3 Pink Pirouette, #1 Blush Blossom, #4 Creamy Caramel. For the pig that is looking directly at you, I stamped in the same color and order and added #5 in Creamy Caramel. The middle panel is done using the Milk Paint Technique using Pretty in Pink card stock. To make sure all my nail brads were uniform, I used the Double Circle Punch. The sentiment is stamped in Riding Hood Red using a SAMJ. The bottom panel is a piece of retired DSP from Stampin' Up! I sponged all edges of card stock and adhered Faux Brads (1/4" Circle Punch covered with a Clear Gel Pen). Don't forget, you can SAVE 10% on all Kitchen Sink Stamp purchases when you use code LISA10KSS - feel free to pass it on! Wanna chance to WIN some KSS products? Get out your Kitchen Sink Stamps and play in this months KSS Challenge! This is just too cute, Lisa! Love the DP you chose to go with these piggies!! Just perfect! 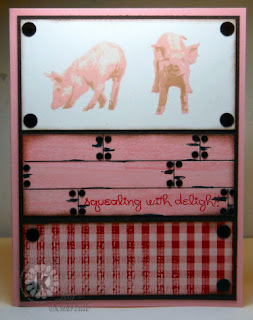 Love the fabulous board and gingham design for these pink pigs!! What could be more perfect for them? Amazing work, Lisa!! Oink, oink! Great card and love the different paper & how you layered it for the sketch. I just love the piggies!! Your great design and choice of papers make them so much cuter!! The colors for the pigs look great, Lisa! The paper is a perfect match, too. I love the Milk Wash technique on your pink fence. Such a great complement to the pigs. Perfect! Too Cute Lisa!! I love the layout! Oh my gosh I love the pink wood boards and of course the pigs too! Love it. Great job with the sketch. Thanks for playing along.